This cylindrical arm single (lock or chain stitch) needle unit can stitch from inside or outside by changing the kind of folder. Thanks to the stepping motor there is no need to change the gears in order to adjust the stitch length and reset the unit. 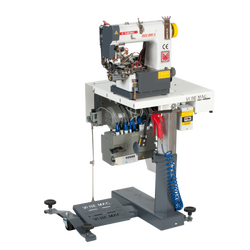 Also, a large rotary hook together with the special needle feed transport system with double roller (puller) permits to hem perfectly pants, jeans and jackets in any fabric. -Vi.Be.Mac. is proud to present a new unit, entirely designed and manufactured in its own factory- the 3022 BHE (C = chain / L = lock). This unit represents Vi.Be.Mac.’s solution to the problems with trousers hemline: accurate, productive and flexible that are the hallmarks of all Vi.Be.Mac. products. -The sewing head design allows to convert the machine from lock stitch to chain stitch and vice versa, in case of changing style. You don't need to buy a new machine. With some additional parts and a couple hours of adjusting and you are ready to create a new style. It is possible to work inside in or inside out by replacing the folder to the required size: the standard folder is from 9 to 30 mm wide, while some special folders that are sold separately can reach up to 42 mm in width. -The stitching length is set electronically, hence, it is faster and easier to adjust the unit. The puller system, a Vi.Be.Mac. 's invention, is composed of a lower roller feeder with an extremely powerful, patented upper puller that easily handles more delicate operations, such as crossovers or lap felling, especially with heavy fabrics. Completing the picture is a king size rotating hook that saves time on changing the bobin and the smallest cylinder arm in the market that makes it easy to work with kids and ladies garments.